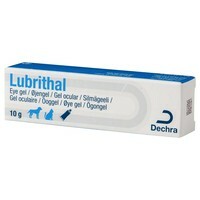 Lubrithal Eye Gel is a carbomer lubricating fluid to aid in moisturising and maintaining the tear layer of the eye. Most eye lubricators such as just add moisture to the cornea, however, Lubrithal is a carbomer moisturiser and as such retains moisture in the tear film for far longer. Unlike hypromellose or Viscotears this product does not require a pharmacist to dispense nor a prescription from your vet. Lubrithal is a veterinary product which can be bought at any time. Apply as required or as directed by your veterinary surgeon. My dog has dry eyes and was prescribed Viscotears by the vet, which now requires a prescription. Lubrithal does the same job without a prescription and seems to be working very well. It is also less expensive than obtaining Viscotears from the vet. I would recommend this product.